Acknowledged author Victor Schwartz wrote Torts, Cases and Materials (University Casebook Series) comprising 1389 pages back in 2015. Textbook and etextbook are published under ISBN 1609304071 and 9781609304072. 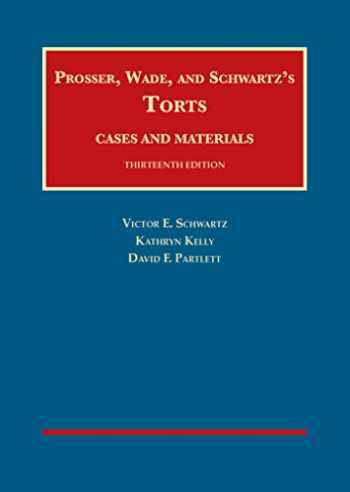 Since then Torts, Cases and Materials (University Casebook Series) textbook received total rating of 3.5 stars and was available to sell back to BooksRun online for the top buyback price of $64.58 or rent at the marketplace. Through its excellence in scholarship, clarity, and ease of use, this casebook engages readers in a critical thinking about tort law. It sets forth crisply edited classic tort cases as well as cases reflecting the newest tort law trends. Its authors are a strong combination of respected scholars and those who practice in the subject. The casebook goes beyond judicial decisions and includes key tort-centered legislation and comparative perspectives where relevant. The casebook encourages the reader to understand the law's foundations and debate modern trends within various policy prescriptions. Unbiased in its approach and organized in manageable sections of information, the casebook is a superb tool for productive and stimulating classroom debate. Tort law doctrine and its rationale will come alive for students. The casebook, proven over 13 editions, assures that our students will be effectively guided to embrace the law of torts as a building block for the remainder of law school and a life in the law beyond. This new edition insures that it will maintain its place as the most widely adopted Torts casebook.